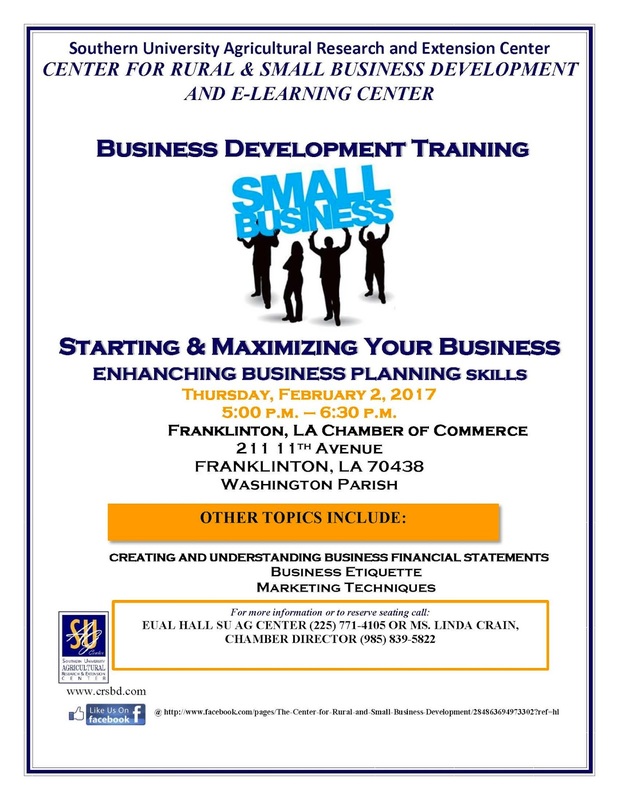 SU Ag Center to host a Small Business Development Training in Franklinton, La. Baton Rouge, La. 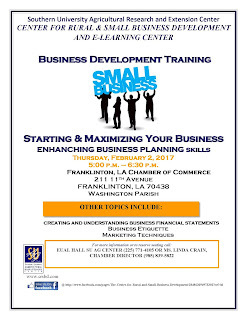 – The Center for Rural and Small Business Development (CRSBD) at the Southern University Ag Center will host a small business development training from 5 p.m. – 6:30 p.m. on Feb. 2 at the Franklinton Chamber of Commerce, 211 11th Ave., in Franklinton, La. “This is the ideal training for anyone who is interested in starting a small business or for current small business owners who want to learn how to maximize their businesses,” said Eual Hall, CRSBD Business Development Specialist. The training, which is free and open to the public, will cover the topics of creating and understanding business financial statements, business etiquette and marketing techniques. For more information or to reserve a seat, contact Eual Hall at 225-771-4105 or Linda Crain, Director of the Franklinton Chamber of Commerce at 985-839-5822. Baton Rouge, La. 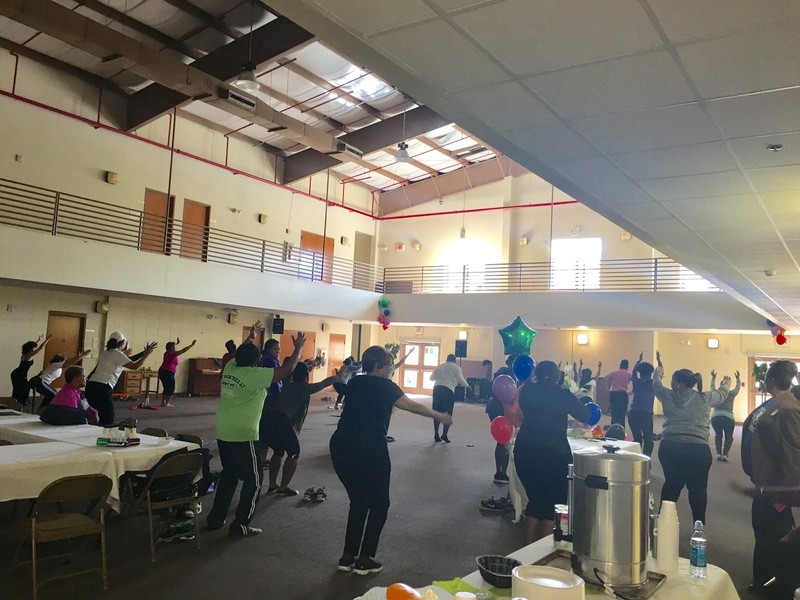 – The Land-Grant Campus’ Nutrition Education staff partnered with the Shiloh Missionary Baptist Church's Health Care Ministry and the Susan G. Komen Foundation to host a Nutrition and Wellness Symposium. The event was held on January 14, 2017 at the Shiloh Missionary Baptist Church. Symposium attendees, who ranged from adolescents to seniors, were engaged and eager to learn. Activities included yoga, fitness sessions and herb and container garden planting. For more information about the Land-Grant Campus’s nutrition education programs, contact us at 225-771-2242 or via e-mail at ellen_mcknight@suagcenter.com. Baton Rouge, La. – On Wednesday, January 11th the Southern University Ag Center hosted a Vision Circle Party for the Outstanding Mature Girlz (O.M.G.) Club at Kentwood High Magnet School. 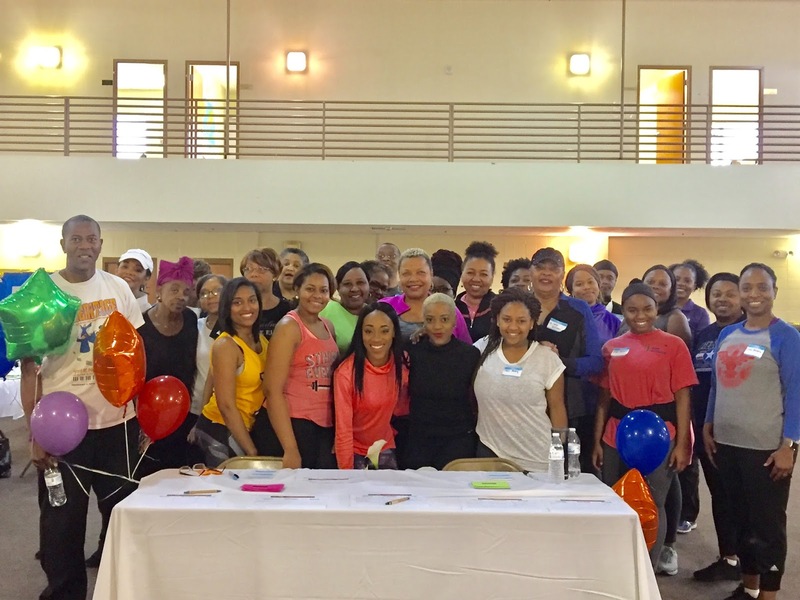 There were 43 young ladies in attendance, analyzing ways to manage personal and material resources to achieve their personal goals in 2017. Vision Circles are visual representations of what an individual envisions for their life. Individuals are encourage to use personal photos or visual materials to define their year-long aspirations and goals. “This year we chose to play off the cyber lingo hashtag for our theme, which was #RealLifeGoals, it’s just a fun way to keep the girls talking about their real life goals,” said SU Ag Center’s Assistant Area Agent, Nicolette Gordon. 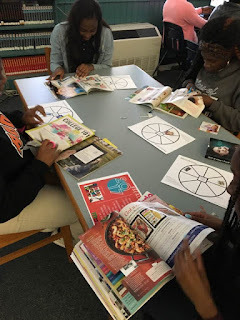 Club members were encourage to complete their Vision Circles and also participate in a contest where they could upload their Vision Circle to Instagram in an effort to win $25 toward one of their ‘Just for Fun’ goals. 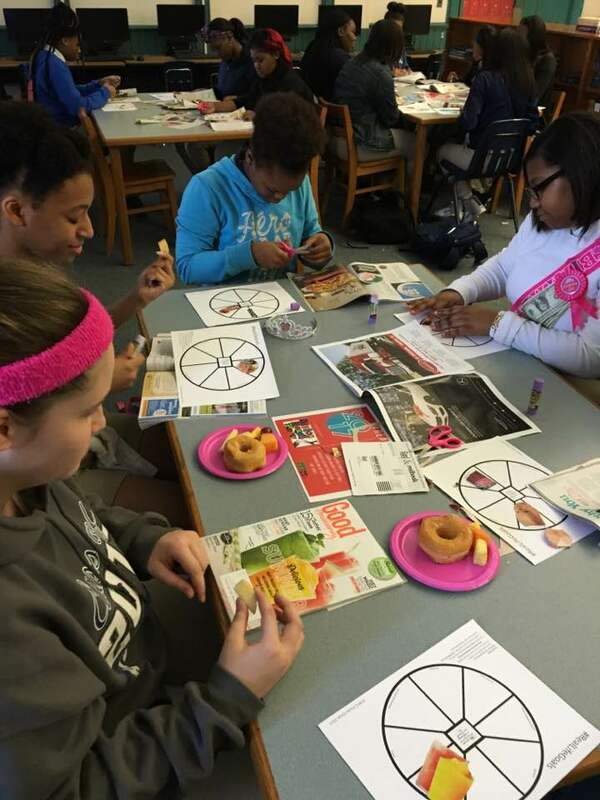 The next vision board party is scheduled to take place at St. Helena College & Career Academy at the end of January. For more information about the O.M.G. Club, contact Nicolette Gordon in the Tangipahoa Parish Extension Office at 985-748-9381, or in the St. Helena Parish Extension Office at 225-222-4136. Baton Rouge, La. – The Southern University Agricultural Research and Extension Center’s 74th Annual State Livestock & Poultry Show will be held March 2 - 4, 2017 at the Maurice A. Edmond Livestock Arena, Hwy. 61 North, in Baker, La. Nearly 200 young farmers are registered to participant in the show. These young farmers will show animals, some nearly twice their weight, that have either won or were showcased in a parish competition. Judges will name the state champions of the show in the various breeds of cattle, hogs, sheep, lamb, goats and poultry. Winners will receive premiums, ribbons, rosettes, silver platters and trophy belt buckles. There is a processing fee that is not included in the original cost of the meat. 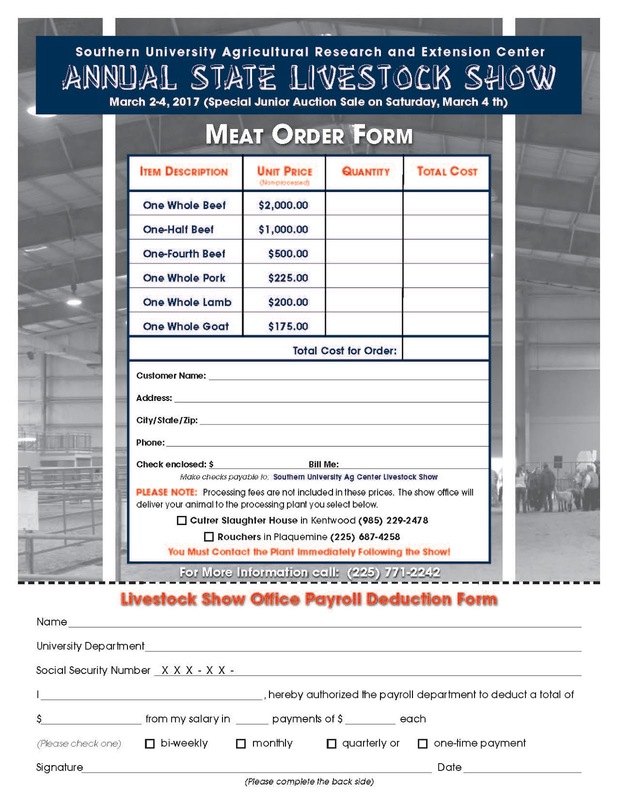 All purchases must be paid by money order or check and made payable to the Southern University Ag Center Livestock Show, prior to picking up the meat from the slaughter house. 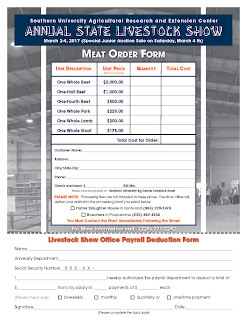 Those who don’t pre-order their meat are invited to make a purchase during the show’s ‘Junior Auction Sale’ on Saturday, March 4 beginning at 9:30 a.m. at the Maurice A. Edmond Livestock Arena. The office will deliver the meat to two locations, either the Cutrer Slaughter House in Kentwood (985) 229-2478 or Rouchers in Plaquemine (225) 687-4258. For more information on the SU Ag Center’s Livestock Show, how to participate in the show or to purchase meat, visit http://www.suagcenter.com/livestock-programs or contact the Livestock Show Office at 225.771.5270 or 225.771.6208. 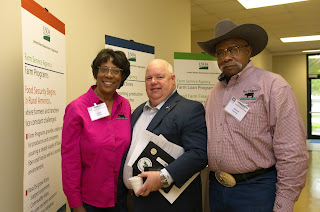 Pictured from left during the Ag Expo's agricultural awards and legislative appreciation luncheon are, SU Ag Center Vice Chancellor for Extension Dr. Dawn Mellion-Patin, State Representative Katrina Jackson, Crystal Johnson, Ag Expo Young Agricultural Producer Award recipient Nik Morris, Debra Sensley, Spencer Sensley, Skyler Sensley, Ag Expo and State Legislator Outstanding Producer Award recipient Willie Sensley, SU Ag Center Area Agent Odis Hill and State Senator Mike Walsworth. Baton Rouge, LA – Nik Morris and Willie Sensley, both clients of the SU Ag Center, received recognition during the North Louisiana Agri-Business Council and University of Louisiana at Monroe’s College of Business and Social Sciences Agricultural Awards and Legislative Appreciation Luncheon. The luncheon, which is one of several events held during the annual expo, took place at the West Monroe Convention Center in Monroe, La. on Friday, January 13. It honors legislators and regional leaders in agricultural production, service and business. Morris was presented with the Young Agricultural Producer Award by State Representative Katrina Jackson. State Senator Mike Walsworth presented Sensley with the Outstanding Agricultural Producer Award, along with an Outstanding Producer Award from the State Legislature. Louisiana Commissioner of Agriculture, Mike Strain, D.V. M., served as keynote speaker for the luncheon. The North Louisiana Agri-Business Council is a not-for-profit corporation governed by a volunteer board of directors. Its mission is to provide education across all demographics regarding agriculture’s contributions to the basic needs of food and fiber, and economic welfare. For additional information about the Council or its Ag Expo, visit agexpo.org. Baton Rouge, LA – Edith and Alfred Gross from St. Helena Parish are among producers traveling to Lexington, KY for the annual Southern Sustainable Agriculture Working Group (SSAWG) conference, January 25-28. They are serving as presenters at this year’s conference on the topic of “Intensive Cattle Grazing on a Small Scale.” This retired couple talks about making a profit on a 25-acre, 12-cow herd. The Grosses have owned and managed Two G Ranch, a 25-acre Black Angus ranch, since 2007. They were seeking higher ground from weather like Hurricane Katrina. Alfred became sold on the rotational grazing strategy after traveling with the Southern University Agricultural Extension Center to a training featuring Dr. Ann Wells (2017 presenter). Thereafter, Alfred participated in an SU 18-month Agriculture Leadership Institute and numerous workshops and seminars (including three SSAWG Conferences) on fencing, grass management, animal health, and marketing strategies. After retirement, Edith participated in a six-month SU Agriculture Leadership Institute. She has led sessions on recordkeeping and farming as a small business. By using a combination of marketing techniques—private sales and stockyards—they have developed a profit-making operation. Alfred and Edith are active members in the local cattle group, St. Helena Cattle Company, and Louisiana Ranchers and Farmers Association. Because they are late starters in the farming community, they welcome the opportunity to share their story with others who have shared goals. The Southern Sustainable Agriculture Working Group, commonly known as Southern SAWG, was founded in 1991 to foster a movement towards a more sustainable farming and food system – one that is ecologically sound, economically viable, socially just and humane. It functions as a regional entity, working with and through hundreds of associated organizations across 13 southern states. By building partnerships, sharing information and conducting analysis, it transforms isolated ideas and innovations into practical tools and approaches for widespread use. 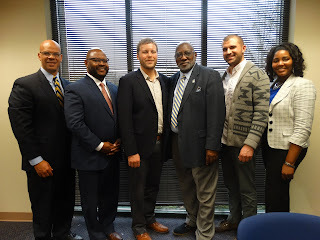 In advancing the Medical Marijuana Program the Southern University Ag Center and the Southern University System Foundation held an initiation meeting on Jan. 5 with the Marijuana Policy Group and the Denver Relief Consulting, who have been contracted as RFP developers for the operation. Potential vendors should register at http://www.suagcenter.com/cannabis. 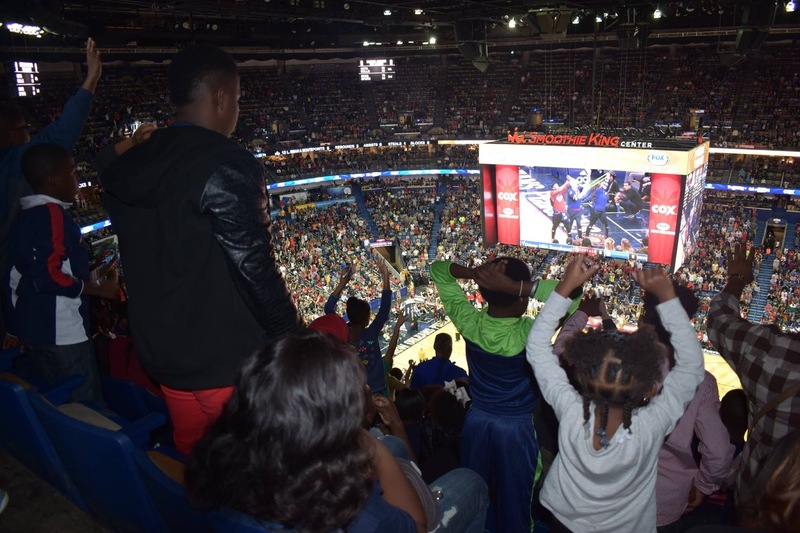 Kentwood After-School and Summer Enrichment Program (KASEP) campers anxiously watch the New Orleans Pelicans take on the LA Clippers on Dec. 28, 2016. 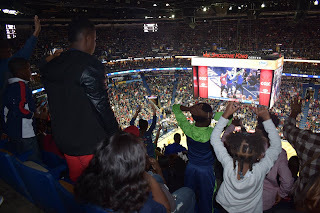 Baton Rouge, LA – Thirty participants from Kentwood After-School and Summer Enrichment Program (KASEP) were recipients of one free game ticket to the Pelicans vs. Clippers game on December 28, 2016. 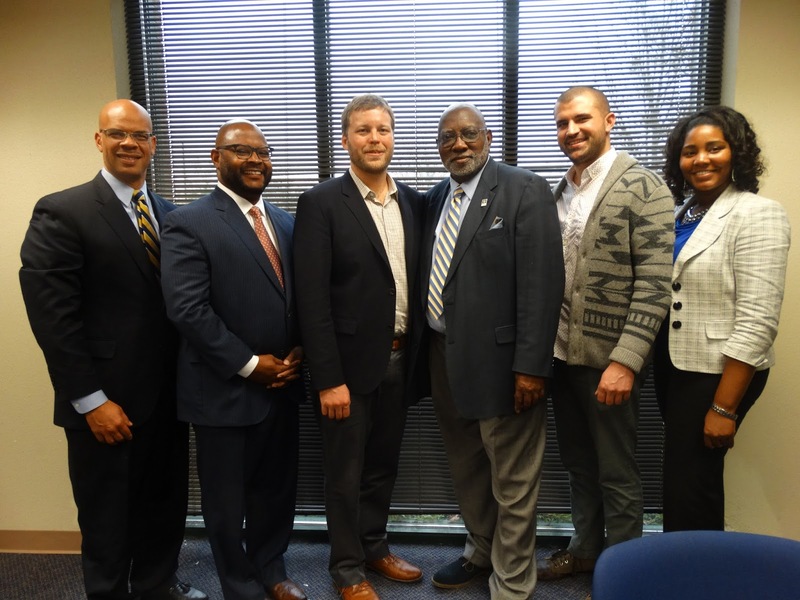 This initiative is a collaborative effort spearheaded by KASEP Program Director, Eric Brumfield; Political Leader, Derrick Edwards; and SU Ag Center’s Assistant Area Agent, Nicolette Gordon. Youth along with volunteers that have worked with the program throughout the summer were able to enjoy, one more day of free time before returning back to their regularly scheduled programs for the next semester. Many youth anxiously watched as the Pelicans went on to beat the LA Clippers with 1.4 seconds left on the clock in a very close game. “Going into the New Year, we’re going to make sure every child that participates in our program gets a chance to experience an NBA game,” said Eric Brumfield. For more information on volunteer opportunities, or community partnerships with the Kentwood After-School and Summer Enrichment Program, please contact Nicolette Gordon via email at nicolette_gordon@suagcenter.com or in the Tangipahoa Parish Extension Office on Monday, Wednesday, and Friday at 985.748.9381. During the year, The Water Institute will work with various partners on the restoration project, including Southern University Agricultural Center, Forum 35, the LSU AgCenter, and the state's Department of Wildlife and Fisheries. Read more in the Advocate.